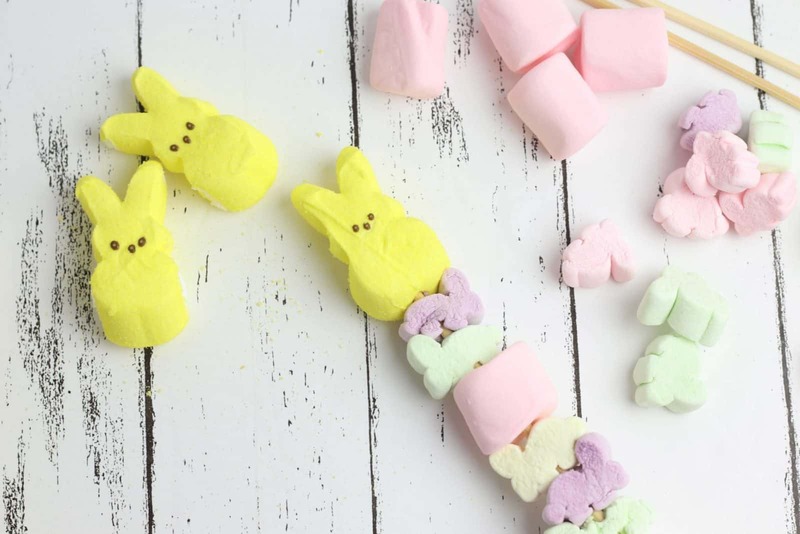 How cute are these Easter bunny peeps marshmallow kabobs? 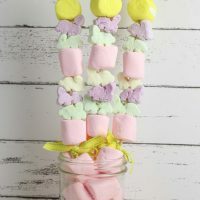 They look great in a mason jar as a party centerpiece and they’re so easy to make the kids can join in the fun! Of course that makes them a great choice for an Easter play date too, because the kids can make the treats for themselves. Just be careful of the sharp end of the skewer! 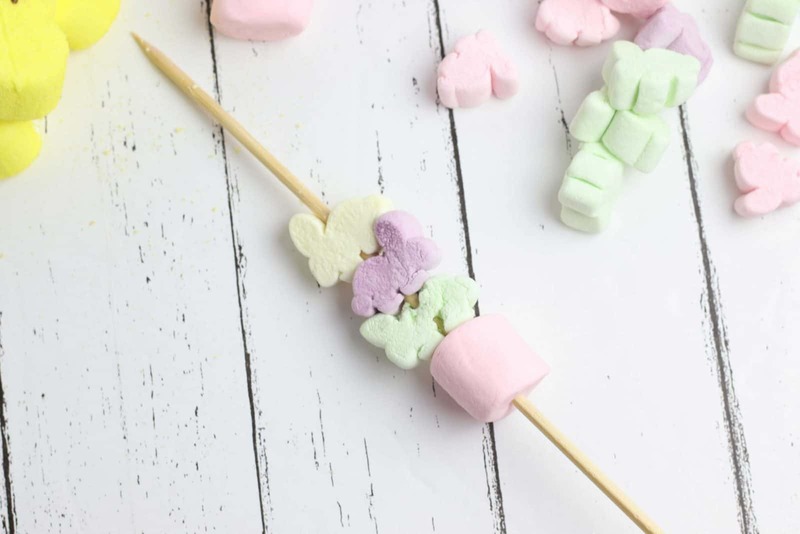 Here’s what you need to make your marshmallow kabobs. You’ll have enough supplies to make 12 of them. If you’ve ever made kabobs before you’ll know that the marshmallows sometimes get stuck to the skewer on the way down. So before you start threading spray the kabob sticks with nonstick cooking spray or simply wet them with water. Be sure to wipe away any excess before adding the marshmallows though! 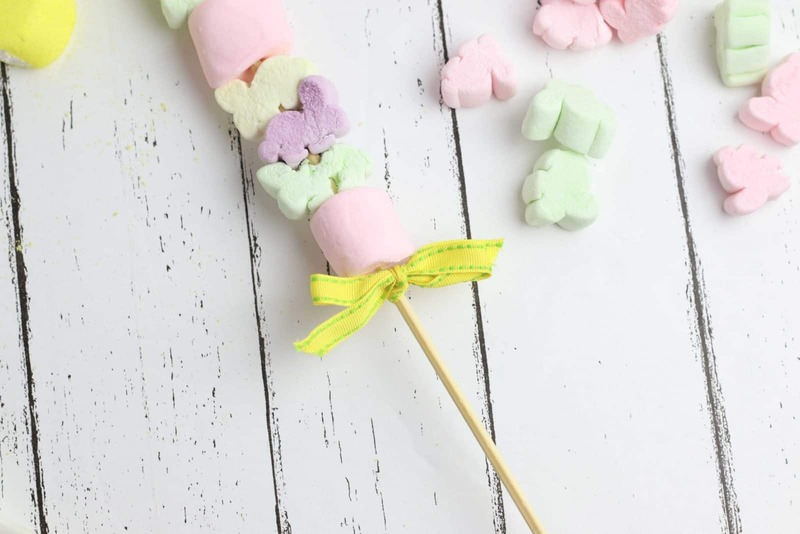 The stick will dry out as you are putting your treats together so keep a damp piece of paper towel to hand so you can give it a wipe between marshmallows. Start by threading three of your bunny shaped marshmallows to the center of the kabob stick. Then add a strawberry marshmallow on top of the bunny marshmallows. 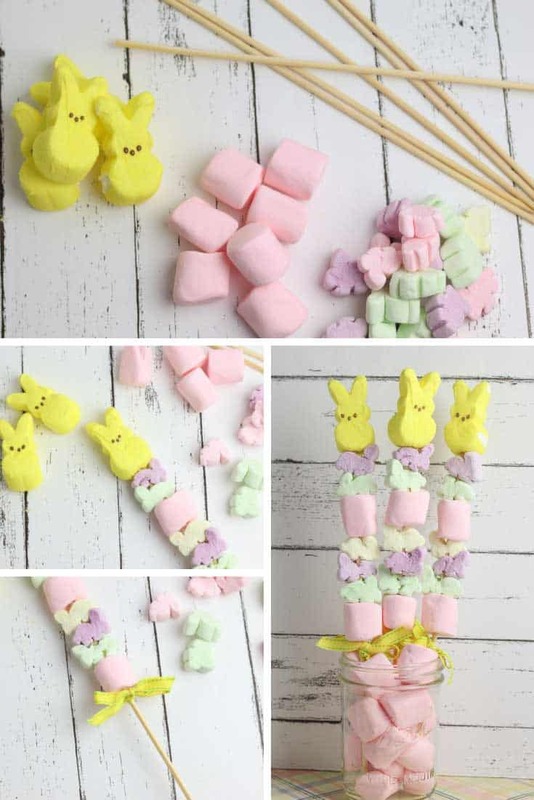 Now add two more bunny marshmallows and then top the kabob with a bunny Peep. Now you can finish off by adding a decorative ribbon tied in a bow to the bottom of the kabob. 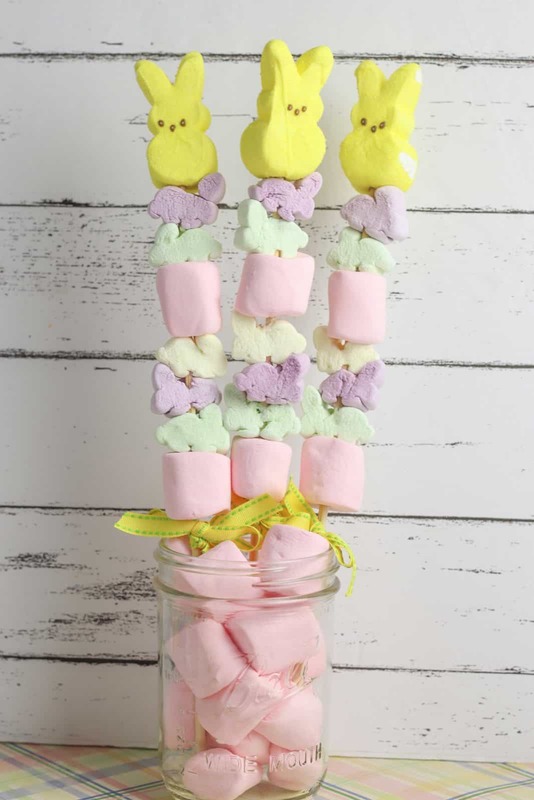 If you want to use your marshmallow kabobs as a centerpiece simply fill a mason jar with pink marshmallows and then poke your kabob sticks through so they stand up in the jar. Add three bunny shaped marshmallows to the center of the kabob stick. 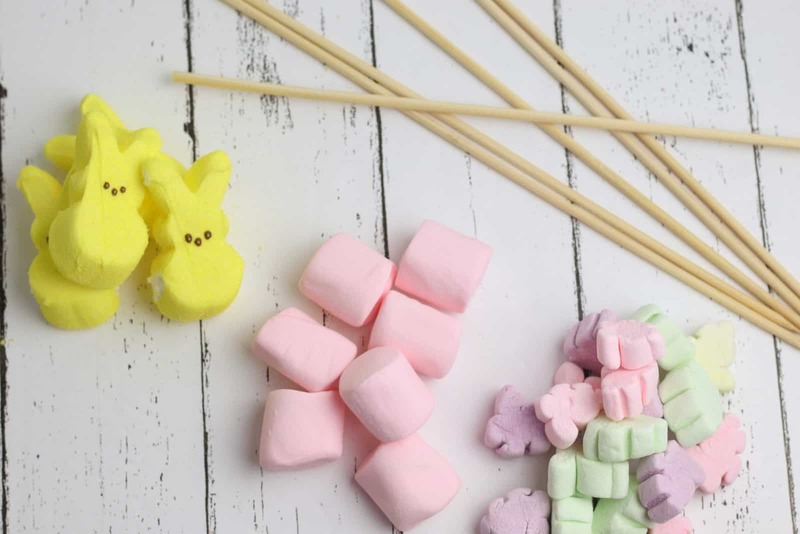 Place a strawberry marshmallow on top of the bunny marshmallows. Add two more bunny marshmallows. Keep a damp paper towel nearby to wipe away excess marshmallow as you add each one to the stick.